Wellington is a wonderful city and has the best cafes to start your day the right way. Here are 3 of the best! The Hangar is the flagship café of Flight Coffee, who produce amazing coffee while always aiming to have the best impact they can on the industry. 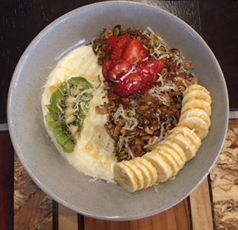 Located in an airy space on Willis Street, come for the coffee but definitely stay for breakfast. The granola was simply amazing! Tucked away in Civic Square this cafe is not the easiest to find, but is worth getting lost for! Open from 7am on weekdays (8am on the weekends), you have the option to build your own breakfast starting with eggs and adding on anything from bacon to kimchi! Delicious with a lovely vibe. Seize is all about clean eating, and who could have known that waffles could be so healthy? With lots of vegan options, including delicious brownies, Seize really is a treat. I have been thinking about the mountain of bags I use everyday. I will really try to be more plastic conscious in future.